10 reasons ‘War & Peace’ the show is better than the book. Much better. You might have already read ‘War and Peace’, so you probably think you’re better than me. And that may be true. But it doesn’t make me wrong. War and Peace is a very famous novel by Leo Tolstoy. One of the most famous, if you believe what other people say about it. It’s also really long. Epically long. It’s four volumes, 1,255 pages weaving the lives of five aristocratic families (among roughly 600 characters) in 19th century Russia with religious philosophy, military strategy and economic theory. “Um, why didn’t you read the book for this article,” you might be asking. Well, that’s a great question. The answer is that I just didn’t have 45 years to write this article. There was a much tighter deadline. And frankly, I am just not up to it. And I’m not alone. So I’m going to watch the TV show. And you should too. Why? You might think you do. It might even be on your shelf. But you don’t have the time, I promise you. You barely have time to read three-minute articles on your phone! How are you going to get through 1,255 pages? Have you heard of Clive James? I have. I think. Anyway, he loves the Tolstoy novel. He says things like, “No human feeling was unknown to him,” which sounds like a very big compliment, if a bit difficult to prove. Well, Clive (seriously, the name does ring a bell) seemed to enjoy the show. 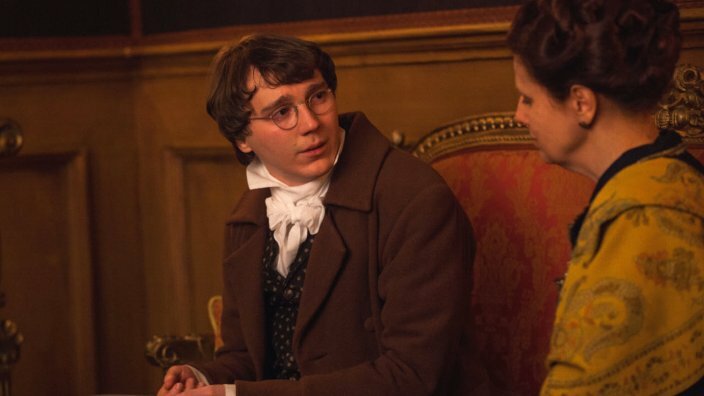 “I’d always meant to get round to reading War and Peace,” said Paul Dano, who plays Pierre. Is this what Leo Tolstoy would have wanted? I don't know. I haven't read the book. Is "Leo" short for anything? What is Tolstoy hiding? It’s a minor gripe, but you know I’m right. You feel it too. Da Vinci, DiCaprio and the Teenage Mutant Ninja Turtle are all Leonardos. But Tolstoy? In English, he's just Leo. In Russian, he’s called Lev Nikolayevich. Are you going to sit through 587,287 words where this is not explained? You’re deep in the throes of a fast-moving, hard-hitting cultural conversation, exploring the intricacies of a movie or a TV show. Ideas are flowing freely. Bonds are being made. The record scratches, a baby cries and the conversation grinds to a halt. Everyone looks at the person (usually named Glen) sitting there stroking his goatee, thinking about how much smarter he is than everyone else because he’s read the book. When I found out that Paul Dano was going to play Pierre, I did not become furious, because I have no idea how he’s described in the book. What I did know was that Dano was good in There Will Be Blood. I didn’t jump on Twitter and create #NotMyPierre or stop people in the street to scream, “Tolstoy wanted Natasha to be taller!” I moved on with my life. Yes, there are other screen versions of War and Peace out there, but I have no idea how to watch them. And while I would never tell anyone what to watch, I am pretty sure you should not watch those versions. They weren’t even born yet. In the UK, watching this series inspired people to buy the book and put it on the bestseller list for the first time. Whether any of those people actually read the book remains a mystery. 20 years after its release, Nick Bhasin comes face to face with the lyrics of the '90s smash hit for the first time.